Cathy Barrow is a freelance food writer, cooking teacher, and food preservation expert. Barrow writes the "BRING IT" column in the Washington Post's food section. Her first cookbook, Mrs. Wheelbarrow's Practical Pantry, won the prestigious IACP award for best single-subject cookbook in 2015. She has written for the New York Times, Garden and Gun, The Local Palate, Saveur, Southern Living, Food52, All Recipes Magazine, NPR, and National Geographic, among others. Cathy lives just outside Washington, D.C. with her husband and two rescued terriers. My favorite new cookbook of the year . . . These aren't the gooey fruit oozers I associate with the American classic -- in fact, half the recipes are savory, and many of the "Sweetie Pies" don't even involve fruit. This richly illustrated work brings a fresh, creative approach to slab pies; essential for weeknight meals and potlucks. 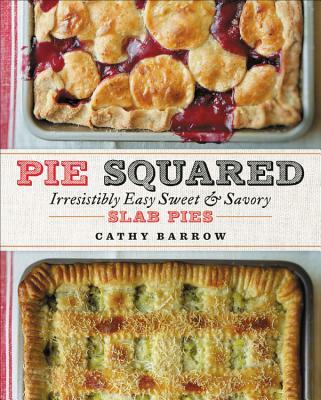 Barrow devotes an entire, glorious book to the subject of slab pies . . . The most challenging part of this fun and inviting cookbook will be choosing which recipe to make first. Pie Squared is a collection of creative and ambitious-yet-approachable recipes that, in aggregate, argue that just about any dish can be turned into a slab pie.